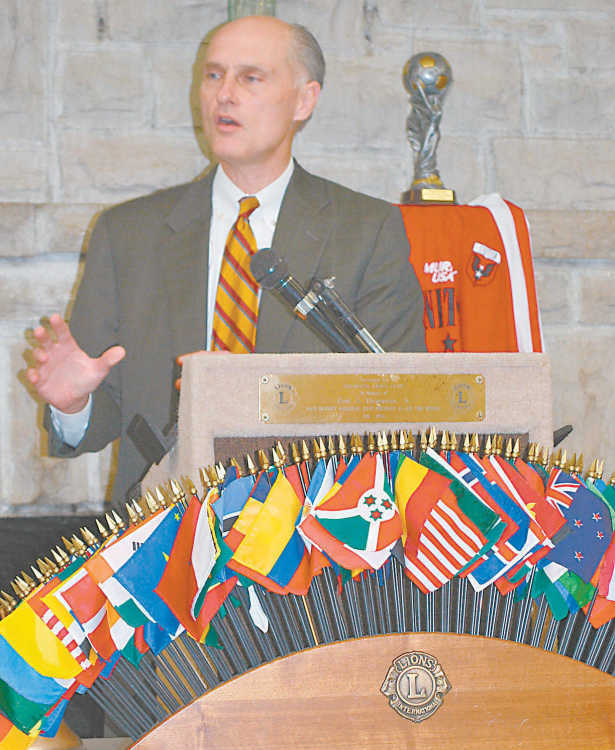 Second Judicial District Circuit Judge John Fogleman was the guest speaker at the Trumann Lions Club Eednesday, Jan. 20 and discussed an array of topics including the Supreme Court and the West Memphis Three case. Fogleman is a candidate for a judgeship on the state Supreme Court. He noted that over the next seven years, the court will dramatically change. "Every justice that is currently on the court will be gone with the exception of one," Fogleman said. "And it is because of age. The law in Arkansas states that once a judge turns 70 and they run for judge, they will forfeit their retirement." Fogleman said two slots on the bench will be open for election in May. "We really need experience on the court," he said. "For lawyers to be able to do their jobs, they need to have consistent judgments from the Supreme Court. It is extremely important for the Supreme Court to follow precedent." The circuit judge said some cases the Supreme Court was involved with that affect people from Arkansas include the Lake View decision and decisions with what officers can and can not do. "We as judges and lawyers take our oath to follow the law," Fogleman said. "We need to have clear guidance." He said that at 54, he is the oldest candidate running for Supreme Court. Fogleman also discuss the 'West Memphis Three' murder trial. Fogleman was a deputy prosecuting attorney during this case. Last week, Judge David Burnett denied new trials for Jessie Misskelley and Jason Baldwin. The two claimed they were not adequately represented at trial. "They found a hair that belonged to a step-father of one of the boys and another hair belonging to a friend of that step-father," Fogleman said. "But, what is really unusual about finding a hair from a step-father on his step-son? I would think that would be something expected. "And you know, for 15 years the defense said it was step-father 'A'. And the hair is from step-father 'B'. A New York City public relations firm is being paid to do all this work. Hairs are meaningless. A hair from a step-dad on a step-son shouldn't be unexpected." Fogleman did say that in his time as a deputy prosecutor, he did have cases that were more clear cut. "This was a difficult case," Fogleman said. "But it was investigated thoroughly. Many people were looked at in this case. But I will say, every piece of evidence we had pointed to those three." In the grossly misconstrued description Fogleman weaves here, one might indeed be led to think that "hairs are meaningless." What is alarmingly meaningful, however? The facts: namely, that a hair linked by DNA to Terry Hobbs, stepfather of Steve Branch, was found IN THE LIGATURES binding NOT Hobbs' own stepson, but instead Michael Moore, another of the murdered boys. If Fogleman can't even get the most important and obvious facts straight today, what confidence can we realistically place in his prosecutorial conduct during the original proceedings? I personally will fight tooth and nail against this man's candidacy for a judgeship on the Supreme Court of my home state. Judge Fogleman, I think we've had just about all the "clear guidance" from you we can stand. "Investigated thoroughly"? "Evidence"? The only thorough investigation related to the West Memphis Three case has been the journalistic investigation of the failures of the police who investigated the murders, the prosecutors who prosecuted it, and the judge and juries whose bad decisions and misconduct led to the conviction of three innocent teenagers 16 years ago. There is plenty of evidence of their innocence and only speculation about their guilt. Anyone who is interested in the facts should read Mara Leveritt's meticulously researched book Devil's Knot: The True Story of the West Memphis Three and Dr. Martin D. Hill's careful and even-handed analysis of all the evidence on his website www.jivepuppi.com. And if you want to judge for yourself just how "thorough" the police investigation was and how much "evidence" they gathered against Damien Echols, Jason Baldwin, and Jessie Misskelley, you can go to www.callahan.8k.com for a wealth of primary documents--police notes, trial transcripts, crime lab reports, etc. I trust that anyone who knows the facts will recognize that Fogleman was, and remains, dead wrong about the case and is not someone we can trust to guard our rights on the Arkansas Supreme Court.